Whilst we’re evangelists for amazing customer service, without any desire for recognition, it’s still always nice to be recognised formally. We were delighted to have the Chairman of Ray White, Brian White, present an excellence in customer service award to Michael Gudgeon recently for receiving 10/10 for his recent work in helping sell the property of Vince & Nancye. Vince and Nancye had a 1/2 acre block of land to sell in Mullumbimby. It was in a quiet and established cul-de-sac and had commanding views of Mt Warning and Mt Chincogan. Whilst it was tucked away, it was still close to many amenities and fronted a reserve. Michel was friendly and professional, and we found him to be honest and tenacious. He always kept us up to speed on the interest and viewings that were taking place on the block of land. 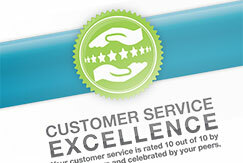 We think some of the key values of our agency are encapsulated in that testimonial: honesty and clear communication. As a multiple business owner-operator, some people would consider me intolerant of bad service and poor performance. Moreover, I’m no shrinking violet with voicing this intolerance toward mediocrity. I demand exceptional customer service and quality standards, so with this mind I came to Michael Gudgeon with a fairly big challenge: Deal with me, and sell 9 blocks of land for me.I gave Michael the opportunity to manage these sales because he sold me a block of land years ago, and I knew him to be a good operator and up for the job. In that sale, there were two buyers involved, but fortunately I ended up being the highest bidder and therefore the lucky buyer. Throughout the process, Michael dealt with me in an honest and transparent manner. Michael’s approach always stuck with me because I’m a straight shooter, and Michael is too. Michael has now just sold Lot 7 (which has always been Michael’s favourite block) to a couple who really wanted to be close to town, but couldn’t find a home suitable for their needs. I’ve got 3 blocks left and I’m very comfortable with the level of communication I receive and so have got every confidence he’ll have no trouble finding willing buyers for the last 3 blocks. If you need property sold, and are looking for an agent, I’d recommend Michael and am only too happy to speak to anyone to provide more information about Michael’s work methods and ethic.